The USS George Washington, a 90,000-ton Nimitz-class aircraft carrier is now patrolling waters off the island of Okinawa as part a huge naval exercise -- AnnualEx 2013 -- involving dozens of warships, submarines and aircraft from the U.S. Navy's 7th fleet and the Japan Maritime Self-Defense Force (JMSDF). The deafening roar of state-of-the-art warplanes being catapulted into the air from its huge flight deck signaled that the USS George Washington was back in combat mode after its recent detour to the Philippines to take part in the aid effort in the wake of Super Typhoon Haiyan. Barely a week on and the 90,000-ton Nimitz-class aircraft carrier is now patrolling waters off the island of Okinawa as part a huge naval exercise - AnnualEx 2013 - involving dozens of warships, submarines and aircraft from the U.S. Navy's 7th fleet and the Japan Maritime Self-Defense Force (JMSDF). The aim? 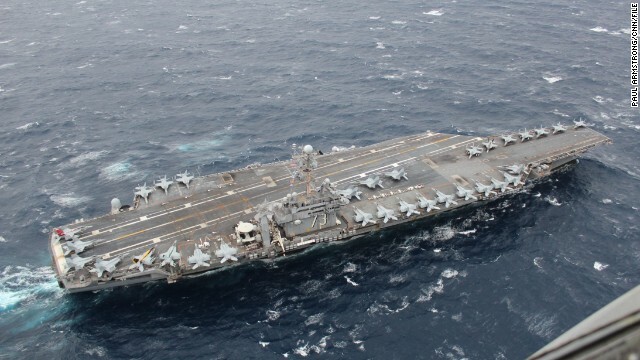 To provide a stern test of their ability to effectively and mutually respond to the defense of Japan or to a regional crisis or contingency situation in the Indo-Asia-Pacific region, according to the U.S. Navy. But this year's war games have taken on an added dimension given the high-pressure atmosphere in the region at present - they take place in the shadow of a controversial new Air Defense Identification Zone announced by the Chinese last weekend. According to this 2014 mil pay chart, service members are getting a less-than-inflation raise in 2014 despite current law that requires congress to close the gap between mil and div pay. Despite this, I'm very confident that those still wearing the uniform will faithfully protect and defend... but they should be rewarded for their hard work and bravery. Over the past 2-3 decades, both parties have sold out the bulk of the American citizens, who they're supposed to represent, by allowing the incursion of illegal aliens (cheap labor) and the "out-sourcing" floodgates to open wider and wider without taking any sensible measures to stem the tide. That whole frigging shortsighted Wall Street mentality from the 1980's to the present has been what has destroyed the real American economy and the future of the American people. This just shows us another reason why "Our Government" has to starting protecting and restoring domestic industry and the jobs that those industries provide. If they do that, the rest will take care of itself. Thanks for the novel. Get a job. china. You no longer deserve to be capitalized out of respect. You didn't learn from US with pollution. You don't seem to see anything wrong with land grabs. Until you end the land grabs and warmongering over oil, you don't have my respect. This is no different than the nazis. Land grabs and de-stabilizing actions are not acceptable. You were making good progress with human rights, but that doesnt just involve Chinese, you can't go around taking land from whom ever you like. You don't deserve to be a world power. And just who are we to criticize China when we're the biggest warmongering land grabbers of all, Random? Did you forget about Iraq already and who keeps making their insane demands that Bashar al-Assad of Syria steps down? We already own the Pacific Ocean plus most of Europe as those countries are currently little more than U.S. sattelite states. Remember the Biblical saying "let him who is without sin cast the first stone"! Iraq – we didnt land grab. Infact it is back under their control enduring more violence than when we were there, all at their own hands. Assad – How clueless can you be? Yes the administration wanted to bomb the stock piles. They lost the keys to the military for that and the people redirected to an acceptable outcome. With out getting involved personally. The international community ended up getting done what needed to be done. As for the conspiracy claims that we secretly own the world, yeah not gonna dignify that with a proper response. Well said, R. Wilson. Don't pay any attention to those jerks who take up for the right-wing idiots in Washington. They've been brainwashed into thinking that way and they won't wise up any time soon! Jack, either you are doing to Mr. Reagan here what I think you are, or else I am doing it to you. Either way, I enjoyed this little encounter. Vary well said us as Americas sure like to take control then wounder why we get attacked. Agree! China has no pollution control policy. Here in Calif. we have succeeded in drastically reducing air pollution from our own sources. Now our air is poisoned by Chinese pollution carried by the jet stream. Does China care? Of course not. All that matters is we unload their containers of cheap goods and put them on the self for sale! This is the same kind of idiocy that started WW1! just when will those idiots in Washington ever learn? Or better yet, when will the majority of American people ever learn? As long as this stupidity persists, there will always be wars!